There is a special happiness in imagining about God. Please see below the recently published e-Books. May Swami's blessings be showered on you all! The reason for this disease of birth is identifying with the body. Deep impressions from previous births sink us into the mire of rebirth. The Witness state God comes as Avatar to establish dharma. Now, Swami, the Poorna Avatar comes as the experiencer. He must come again to enable the coming of Prema Sai and the Sathya Yuga. 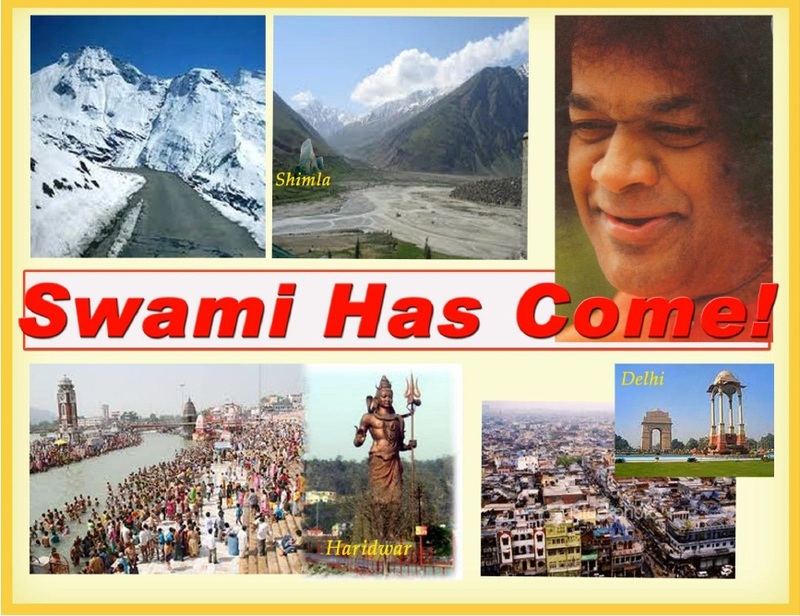 An unquenchable 73 year thirst for God brings Swami back again. In the Sathya Yuga, all dharmas are turned towards God. Whatever caste, creed, clan or ashramas, all will only be to live for God. The New Creation comes through the mind. All become Manasa Putras, mind sons of Sathya Sai Baba and Vasantha. In this world, all types of love are bound by reason and time. God’s love alone has no reason or season. All other forms of love are for a reason and are connected to time. God's love comes as the flooding ocean...an infinite ocean connecting all religions and castes. No one can know the depth and width of this ocean. There is no limit to Swami’s love. If you want to be redeemed from the cycle of birth and death catch hold of God's feet like Mahalakshmi. 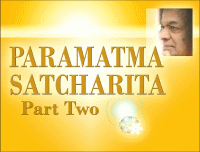 EDITOR's Opinion: Her writing in Paramatma Satcharita part 5 reveals her as the supreme, the epitome of Madhura Bhakthi. The truth of who she is self-evident in her writing... Sai Shakthi. 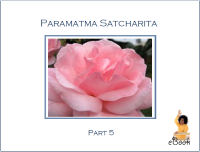 Is Poornam revealed through an individual’s sadhana? Vasantha: Don’t the Avatars reveal Poornam fully? 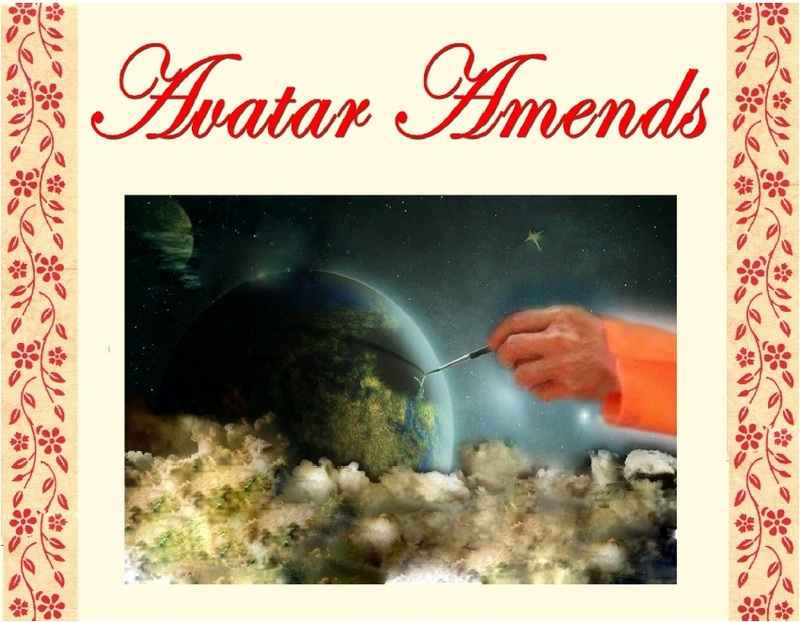 Swami: Avatars have limits. You have revealed Poornam fully through your sadhana. Vasantha: Is the vision of God according to one's sadhana? Swami: Yes, all is according to sadhana. The love and grace of God is all pervading, yet, one reaches it according to their sadhana. What is sadhana? It is to awaken the Antaryami, the Indweller within us. It is according to sadhana that wisdom is revealed. It is through wisdom, we see God within. The passing days bring new feelings forward, new yearning, different yearning for God with a different focus to serve a different purpose. Sai Baba is always with her giving what is needed to move to the next level: a scribbled drawing, greeting card, flowers dropping, visions coming, a half seed on the cot and talk of Mangalyas. She asks, "What is God's body like?" Karma finished, but its poison remains, blackening the body, causing great suffering and pain and great gain for the world. This is the year the pain ends. The sun rises on a changing Earth, purifying itself for the heavenly Spring: Vasanthamayam, Sai Mayam, the Sathya Yuga - the Golden Age of Truth. 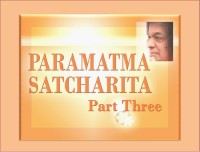 This is Paramatma’s Satcharita; Swami’s Satcharita, which He Himself tells. As I am born from Him, I am His half... I write what He tells me. His feelings and my feelings unite to change the world. It is in this way He reveals my feelings. Swami and I merged in Vashista Cave. Thus, whatever I think, Swami does and whatever He thinks I also think. Our thoughts and feelings are the same. Everyone is an aspect of God. Yet, man forgets we all are God’s children. If our real nature is that of God, we must be like Him. The child must be like the Father. God is Paramatma. We are Atma. All of us are Paramatma’s children. Yet, we leave the Paramatma, which connects to the Atma. Instead, we say that only those who are connected to the body are ours. However, God alone is our own. This must become deeply imprinted in the heart. I am always crying for the world in order to change their difficulties. In order to show this, Swami separated me from Him. This is ‘Love is God’. He separated Himself into two: one in the Witness state, Sathya, the other in the Mother state of Prema, love. This is the task of the Avatar. It is through His Sankalpa, that He Himself separates in two as Vasantha and Sathya Sai. It is from the Vishwa Brahma Garbha Kottam that our feelings emerge and change the world. As I have no ‘i’, I do not possess, the power to control and rule. I have written in many books that Swami left His body and will come again in a new body from here. This new body is a 'Prema body' coming through my Prema. Swami then makes a sankalpa and brings the New Creation. 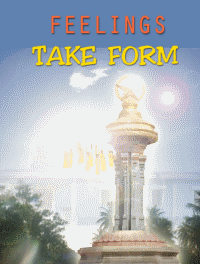 In this book, Swami has described His Avataric task in various ways. He said that he would surely come ... at that time, big destruction will take place and all evils will be pushed out leaving the 5 elements free from pollution. This happening will be the indicator of Swami's return. For the Poorna Avatar to come the 5 elements must purify themselves. For us to come together, the Earth must first be sanctified, made holy. Ignorance must be removed from all and wisdom made to pervade everywhere. For this to happen, Swami separated His own body in two and performed His Avataric task. It is for this task that He took all karmas on His body and left the world. He will now come again in a new body to complete His mission. "In Atma Satcharita, when one Atma cries and wails for God, Paramatma comes and merges that Atma in Him, uniting it with Him. We have come as God and Shakthi to show this to the world. Your life demonstrates this. 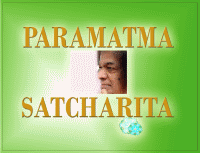 Your Satcharita is Atma Satcharita, Paramatma Satcharita." This is what Swami told. This is Swami’s Satcharita, the other side, which is not known by the world. Swami separated me from Him and made me take birth to help and guide all. The Avatar’s descent is different; they come to establish dharma. My case is not like this. I am Atma. I have no body, mind, intellect or senses. I have nothing. I am Atma. I am neither born nor do I die. I came as light and will disappear as light. My life shows this only. I am never born and I never die. How does the New Creation emerge? Swami shows this in many different ways... many are angles of the Mukthi Stupi and Mukthi Nilayam. This is not an ordinary ashram. It is the place of God’s Avataric mission. As Swami is not an ordinary Avatar, His task is also not ordinary. Is it an easy thing to bring a Sathya Yuga inside a Kali Yuga? This is the greatest Avatar’s task. Here is an example. Once, Brahma Deva hid all the cowherd boys, calves and cows in a cave, closing it for a year. Krishna merely recreated all gopas, cows and calves. Sai Krishna now does the same, but for a thousand years. Sathya Yuga, New Creation, covers the creation of Kali Yuga for a thousand years. If you try now and perform sadhana, you can live happily for 100 years as God’s children and merge with God. If you transform yourselves or not, there will be no deep impressions for a thousand years. Yet, after 800 years, very slowly the old deep impressions will begin to come back. Thus, try and do sadhana now and gain victory. The feeling that we are the doers disturbs our peace. Yet, we perform actions from morning until night. Our lives run at a fast pace with little rest. What do we earn for all this hard work? For a little property, a wife, children and position, we lose peace of mind and have to face misfortune and struggle. Life has no peace. To seek relief man goes to the cinema, visits friends, reads novels and magazines, etc. All these are only temporary solutions. He may forget his troubles for some time, but upon returning home, they reappear. One must look for a permanent solution. True peace of mind can only be found, if all actions are performed as acts of worship towards God. We are only born to free ourselves from feelings of attachment. By turning all actions into yoga, we can achieve this freedom. The expansion of a countless number of bodies is called Virat Swaroopa. It indicates Creation. The expansion of a countless number of hearts is Hiranyagarbha, the divine form. When the Virat Swaroopa and Hiranyagarbha expand through the Atma, it becomes Brahma. Virat Swaroopa indicates the Creation. It gives a countless number of bodies. All is created in this way: human beings, birds, animals, all living beings. Similarly, the Hiranyagarbha creates a countless numbers of hearts. In the New Creation, God will fully function in all hearts. Through my sadhana, the Vishwa Brahma Garbha Kottam emerged. This is Brahma's womb. This is the womb of Adi Moolam, where my heart and Swami’s heart unite. My heart uniting with Swami is the Hiranyagarbha. This is the Adi Moolam heart that expands as the Creation. This is 'Divine form'. Our feelings go out through the Mukthi Stupi and enter the hearts of everyone. When the Virat Swaroopa and Hiranyagarbha expand through the Atma, it becomes Brahma. This is a Heart Creation. The infinite bodies of the Virat Swaroopa is Sathyam. The infinite hearts of Hiranyagarbha is wisdom, Jnana. This Sathya and Jnana become the infinite Brahmam. This is the God principle. The Witness state God functions in the Bhoktha state and comes as the enjoyer. Now the countless Atmas are shown to be one Atma. This is the Paramatma principle; this is Brahman. When the Primal being wills to create, His heart feelings expand as the Creation. Through this love, comes infinite expansion. The final chapter, 'Vibuthi Yoga' shows how this love can be seen in everyone and everything. Swami gave a book filled with pictures and photos of our eternal relationship. 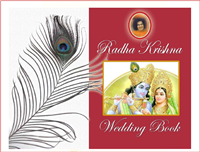 He told us to prepare an eBook based on Radha Krishna marriage. "Krishna Janmashtami is our wedding day, change your Mangala Sutra...I will give you a surprise." Krishna's Govardhana leela is like the coming Sathya Yuga. Kali Yuga children are hidden and replaced with children who follow the path of truth and dharma. Amma describes the Chaitanya Yuga and what it is like living in the coming age of Truth, the Sathya Yuga. All is coming through Sri Sathya Sai Baba's divine rasaleela. A proverb says, "When all live together, millions of benefits come." This pertains to the Sathya Yuga, when all will live together. God will also live among man. There will be no differences. All realize they are only the children of the one God. God will live with all. Sri Sathya Sai Baba will return to correct the shortcomings of past Avatar's and to make 'amends' by re-establishing truth and dharma. 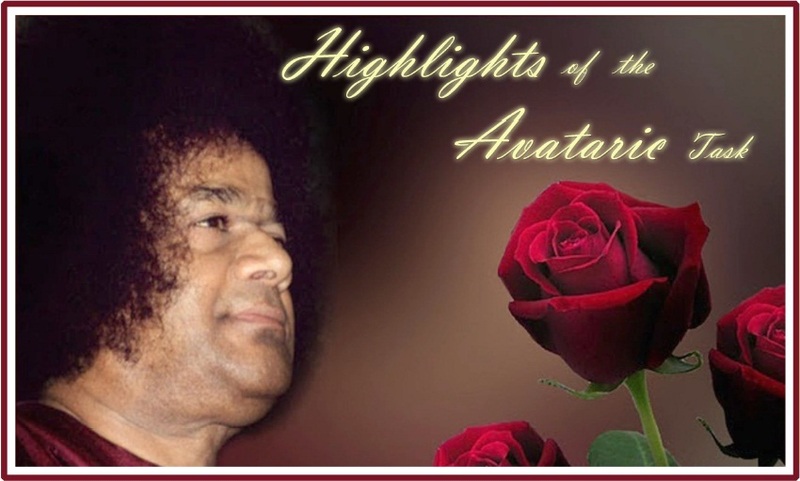 In meditation, Sathya Sai Baba reveals to Vasantha Sai His return to the physical form. After visiting Delhi and Haridwar, He journeyed to Shimla Cave in the Shimla Valley. He is doing 40 days of penance before coming out. 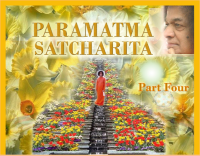 Topics include changing of the Universal Clock, Dr. Hislop's journey to Shimla with Sri Sathya Sai Baba and the explanation of messages and proofs given by Swami. This fourth eBook was written during June and early July of 2012. "Your life is the highlight of the Avataric task. You are born from Me; this is the Prologue of the Avataric task. This is because the important part of My Avataric task started from your birth. 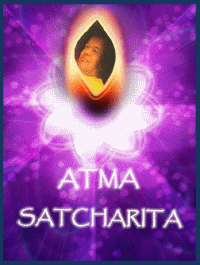 Finally, your body will become a jyothi and enter My body; this is the Epilogue of the Avataric task." 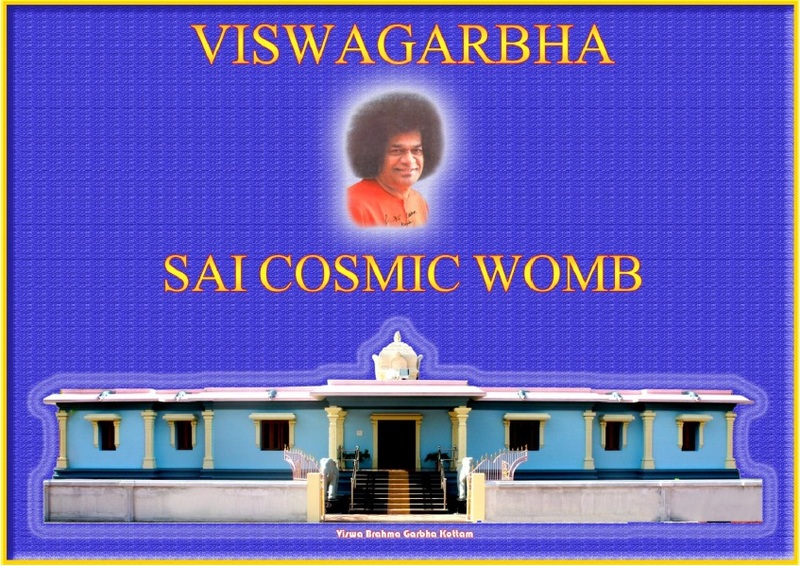 (Sri Sathya Sai Baba to Vasantha Sai in meditation, 9 June 2012). This third eBook was written during May and June of 2012. 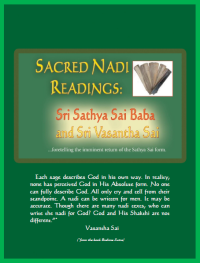 It includes highlights of the Nadi Readings of Sri Sathya Sai Baba and Vasantha Sai taken in May 2012. 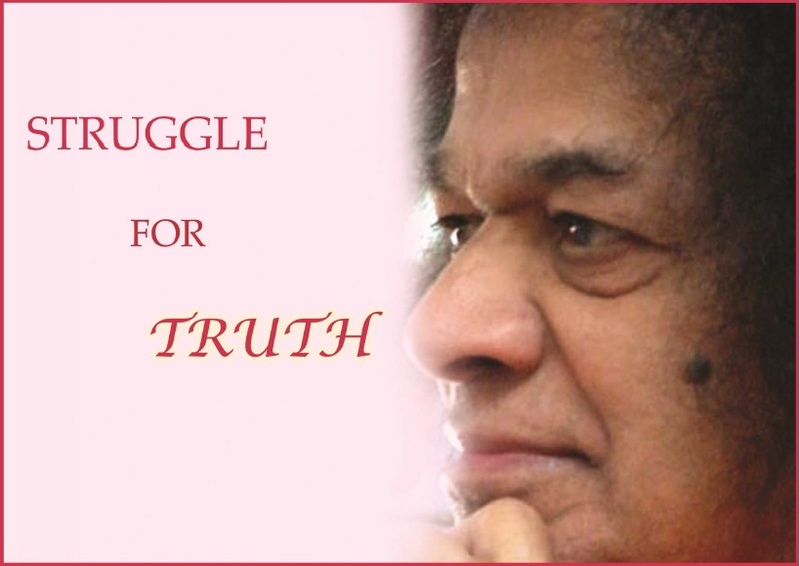 The balance of the book is based on messages given by Swami. Amma writes on the words given by Swami 'Nadis, Cosmos, Creation, Padukas and Age' and points on spiritual life in the section called 'Wisdom Eyes'. At this time when every devotee is waiting for our Lord Sai's return, Sri Vasantha Sai's book is a beacon of hope for the entire Sai world. This book is a new veda, a revelation of truth so far unseen in any of the ages. Here in Sri Vasantha Sai has clearly explains why Swami has left His body, and why He must return. ஒவ்வொரு ஸாயி பக்தரும், பகவானின் மறு அவதாரத்திற்காக காத்துக்கொண்டிருக்கும் தருவாயில், அம்மாவின் தெய்வீக புத்தகங்கள் ஒரு பெரிய நம்பிக்கை அளிக்கும் கலங்கரை விளக்கமாக திகள்கிறது. இந்த புத்தகம் ஒரு புதிய வேதம். இது வரை யுகங்கள் காணாத ஒரு உன்னத உண்மையை வெளிக்கொண்டு வந்துள்ளது. அம்மா மிக விளக்கமாக "ஏன் ஸ்வாமி தன் உடலை விட்டு மறைந்தார் என்றும், எதற்காக ஸ்வாமி மீண்டும் அதே உருவத்தில் வரப்போகிறார்" என்றும் மிக ஆழகாக சொல்கிறார்கள். பகவானின் பிரேமையும், அருளும் உங்களுக்கு கிட்டட்டும்.